If there’s one thing we learned from the last election cycle, it’s that Alaskans care about salmon. No, Alaska voters did not pass a ballot measure that would have strengthened and updated the law protecting salmon habitat, but “salmon love” ruled the day. Even the ads funded by corporations opposed to strengthening the law claimed a love of salmon. We know the Alaskans who sponsored the Stand for Salmon initiative, who knocked on doors to talk about it, who donated to the campaign, and who voted yes on Ballot Measure 1 definitely care about salmon. Many of the people who voted no on Ballot Measure 1 say they love salmon, too. So now that the election is over, campaign claims are behind us, and we’re left with the status quo, what can we do to really protect our fisheries? How can we make sure that we have salmon for generations to come? 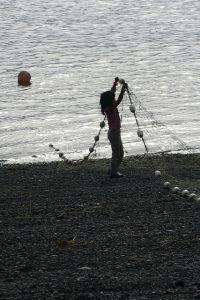 Fishing for food in Dillingham. Photo by R.B. Whitcomb. Of course industry would say the current law works because it sets no standards, makes no demands, and requires no mitigation and accountability. 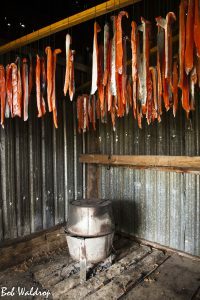 Current law—the one unchanged since statehood—requires the Alaska Department of Fish and Game to ensure the “proper protection” of fish and game. It does not establish any scientific standards to define what that means, and it gives the agency unfettered discretion to do any number of things, from saying no to people walking across streams to saying yes to the complete annihilation of them. The law is essentially a tool of political influence for whoever is in office, not an effective and reliable way of protecting salmon. It requires zero public notice or public process for any habitat permit, regardless of harm done to salmon or the size of the project. In fact, project permits are negotiated behind closed doors between Fish and Game and the project applicant. Current law further fails to require any mandatory mitigation or any mandatory bonding to ensure that project applicants don’t go bankrupt and leave mitigation and clean up to the state. Worst yet, Fish and Game can only enforce violations, should it identify them, through a court proceeding. 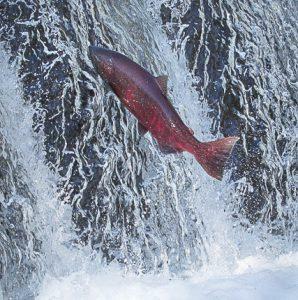 Fish and Game has applied a weak and inconsistent interpretation of “proper protection” that allows the destruction of salmon streams essential to the spawning, rearing and migration of anadromous fish. Little is being done to protect valuable salmon habitat in the face of projects that withdraw water, dredge stream beds, change ground and surface water flows, or bury streams beneath tons of sediment and waste. Ballot Measure 1 attempted to change that when the legislature failed to act. Under Alaska’s Constitution, a citizen initiative can make any law the legislature can make, with a few limitations. Trustees successfully defended this right in court. There are a couple of very important constitutional restrictions. A ballot initiative may not take the allocation of state resources away from the legislature, or from the agencies that have been delegated the legislative responsibility for allocation. When legislators failed to act, a group of fishermen asked for help in writing a ballot initiative that would rewrite the law that governs how Fish and Game permits projects in fish habitat. This initiative had to be drafted in such a way that Fish and Game retained discretion. The resulting ballot measure sought to balance implementing a more robust permitting scheme that would fix some of the problems with the current law while ensuring Fish and Game’s discretion over the process. Opponents of the ballot measure, including agency and industry spokespeople, used Fish and Game’s discretion to argue that the initiative was “ambiguous.” Truth is, Ballot Measure 1 was less ambiguous than current law precisely because it established standards and accountability. Ballot Measure 1 would not lead to more ludicrous outcomes than current law. Indeed, the problem IS the current law. 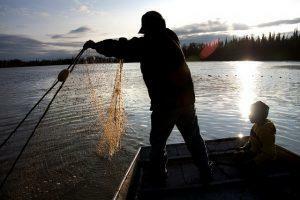 Right now, Alaska law fails to protect salmon. It fails to protect the food source, and cultural, social, and economic force that sustains the Alaska so many of us love. 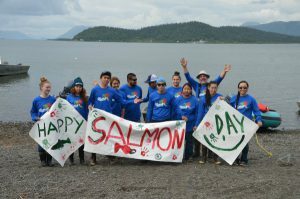 If Alaskans from both camps of the Ballot Measure debate agree about the importance of salmon and its essential place in our future, then what are they going to do together now to protect it? Our grandchildren want to know.